From left to right: Austin Hardy, Nell Rollins, Natalie Jones, and Micah Burkhardt in rehearsal for "La Mela." Photo by Tori Duhaime. What determines how we view identity? This question lay at the heart of La Mela, a program recently presented by Austin Hardy that featured works by local artists Rebecca Aneloski and Stephen Koester. Presented in the intimate black box in the Beverley Taylor Sorenson Arts & Education Complex at the University of Utah, the evening explored questions of performance, affectation and affection, memory, and interpersonal relationships. The works focused on how an individual may relate to social space both within and around themselves, and how those relationships drive who we are and who we become. 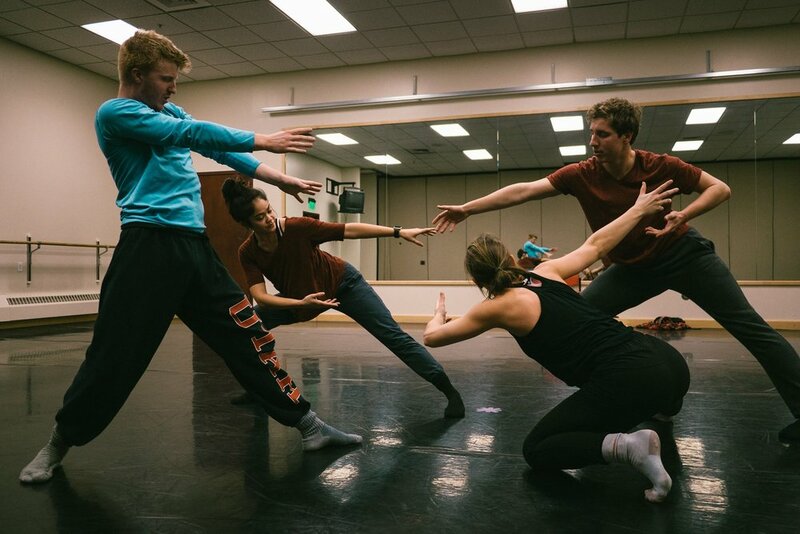 “Man Dance,” choreographed by Stephen Koester, Modern Dance Chair at the University of Utah, was a thoughtfully-crafted work that delved into what it means to be a man. Beyond just being a man, what does it mean to look, act, sound, and exist “like a man”; who successfully gets to be a man and what drives that success? With extremely physical partnering representative of Koester’s style, “Man Dance” was a duet between Micah Sir-Patrick Burkhardt and Austin Hardy, and kept me engaged throughout. The piece opened with Burkhardt and Hardy performing a warm-up. Dressed in gray and black sweatsuits, the two seemed unaware of the audience’s presence until they were suddenly hyper-aware. While their voices dropped from their natural registers, the two continued to repeat “I’m a man!,” entertaining the audience at first, but eventually forcing a question: why did the two men feel the need to repeat this phrase? Even though Burkhardt and Hardy were performing versions of themselves, they were still characterized and performing affectations. I appreciated Koester’s range of references in “Man Dance,” with movement motifs spanning from a Western gun battle to superheros, cavemen, a traditional Jewish wedding dance, and finally to MC Hammer. Each presented its own interpretation of what manhood means and, more importantly, each existed specifically to define masculinity. Burkhardt and Hardy, through these motifs, became the fighter, the savior, the provider, and the arbiter of “cool.” By presenting these motifs in a male duet, “Man Dance” exaggerated the men’s roles and forced the audience to view them as hyperbolic and impossible to embody. Through Koester’s partnering, we were shown authentic weight transference between the two bodies, negating the role of the lonesome male figure. We were shown two bodies relying on each other in a way that was both intimate and clear in its connections. While some of the partnering was meant to be comedic, it maybe only seemed so because of a sense of machismo the dancers were attempting to personify. I felt discomfort for the performers as they tried to manifest these roles with hunched backs and sharp angles, dressed in their sweat outfits, clearly uncomfortable. Towards the end of the piece, we experienced their real physical discomfort as they caught their breath, literally, in a spotlight. Their inability to completely embody the fictionalized, hyper-masculine roles was presented with nothing else to look at. I questioned the role of mishaps in the piece, both of ones that were choreographed and others that might have been accidents. Though sometimes questioning them because of the performers’ reactions, Hardy made me feel his mistakes truly, in a way that enforced an impossible binary. At the end of the piece, both dancers embodied a groove in their pelvis, and I felt Hardy let go of all other roles he had been playing to exist in this physical element for himself. It was appropriate that this came at the end of the piece, as it was an immense relief to see the dancers stop fighting to become something and to simply be themselves. A second work began after a brief intermission, this one choreographed by Rebecca Aneloski, a performer and teacher with SALT Contemporary Dance. I am unsure of the title of the work, but I assume it was “La Mela,” which translates to “the apple” in Italian. This seemed to be a deeply personal work for Aneloski and focused on memory; having worked with Aneloski in the past, I am familiar with her Italian roots. Complementary to this background knowledge, the stage was set with a table and chairs and a bookcase, all in constant shifting motion, and furthering the idea of memory through a familial context. The piece opened with a quartet, featuring Burkhardt, Hardy, Nell Rollins, and Natalie Jones, and quickly grew to a larger cast, adding Natalie Border, Amy Fry, Allie Kamppinen, Haleigh Larmer, Chang Liu, Megan O’Brien, Laura Schmitz, Bayley Smallwood, and Sarah Stott. The large cast engulfed the stage with their presence and with Aneloski’s expansive movement vocabulary. The dancers constantly reached for and pulled each other, seemingly in slow motion even when the pace was brisk. They provided both physical and emotional support, remaining completely connected throughout the piece. Approximately an hour long, the piece as a whole presented moments for each dancer to shine. I was struck by the thought of rediscovering the familiar, by way of memory and of caretaking throughout the entire piece. Regardless of who was being featured at the moment, the rest of the cast continuously arranged and rearranged the set: moving books to and from the bookcase; rearranging cups, plates, the tablecloth, chairs; finding new ways to see these everyday items. I often found myself entranced by what the next configuration on the table was going to be, and was surprised when my focus returned from the dancers to the set and it was completely different than I’d last seen it. Though not explicit, specific motifs were repeated throughout the piece that lent themselves to an exploration of childhood memories. Natalie Border had one of the clearest moments of this, as she could often be seen traipsing around the stage with one arm reaching up and behind herself, her gaze towards the sky, as though flying a kite. She even brought a sense of lightness to some of the heavier moments, her white blond hair breathing fresh air into the scenes, as well as anchoring them. She gave the audience something to hold onto. A feeling of foreboding and death surrounded Sarah Stott from the beginning of the piece through to the end. She was the only dancer to appear in color at first; from her initial entrance, she created drama, as she fell and the other dancers threw flower petals at her body. Throughout the rest of the piece, she swan-dived into the others, trusting them to catch her and seeming not to care what happened to her if they didn’t. At the end, she collapsed again, this time for good, as the titular apple appeared. During the whole piece, we were presented with a style and vocabulary that was uniquely Aneloski’s, though with clear input from the performers. I was continually struck by moments and lines being cut off abruptly and almost awkwardly to create a sense of visual, and probably physical, discomfort. Chests were almost constantly forward, with arms reaching past shoulders, heads raised to create room for protruding appendages. The air surrounding the dancers had a tactile feel. Hands were often held at the hip, seemingly ready for action. During a duet with Burkhardt and Jones, this vocabulary was brought to a writhing climax in Jones’ body as her movement picked up pace and the discontinuous and tactile sensation continued. This hindered her ability to stay on her own two feet and led to beautiful partnering. One moment that stood out to me was a duet between Liu and Stott. They moved with such clarity and assuredness that, even with all the shifting bodies and scenery on stage, my eye was drawn only to them. Amidst chaos, their clarity of line, precise unison, and powerful stage presence was completely engaging. Overall, because of a large cast and constant movement, the work was chaotic. But memory is also chaotic. How we define ourselves derives from memory, both personal and external, and that perception is constantly shifting, much like the stage in “La Mela.” Without being able to pinpoint one specific element, the work felt autobiographical, like Aneloski was telling a story about her life through memory. It felt authentic to the dancers’ stories as well. I appreciated this deeply personal work and know that we can expect to see more from Aneloski in the future. Promotional image for La Mela. Artists of Ananya Dance Theatre in Shyamali at the Kelly Strayhorn Theater in Pittsburgh, PA. Photo by Art Like Us, courtesy of Ananya Dance Theatre. Last Saturday, in the black box of the Beverley Taylor Sorenson Arts & Education Complex (home to Tanner Dance), the audience was treated to an incredibly intense, thought-provoking, rarely soothing, but ultimately affirming performance by Ananya Dance Theatre and its team of nine dancers, all of whom are women of color. The evening, programmed by UtahPresents and lasting a little over 90 minutes with no intermissions, gave the audience a visceral and occasionally physically uncomfortable, but altogether fascinating, view of grassroots movements, dissent, oppression, and support within that dissent, as well as eventually that of resilience and renewal. I had an opportunity to do a workshop for three days before the performance, where I became familiar with the dancers and their unmitigated commitment to activism for social and environmental justice; they embody that commitment at all times, both on stage and in life. The process of taking individual experiences and memories and creating choreography was eye-opening for me. “In our bodies live our stories,” said Dr. Ananya Chatterjea, the arrestingly charismatic director of Ananya Dance Theatre. The choreography and performance of Shyamali: Sprouting Words demonstrated that convincingly. The performance consisted of three acts, which followed each other seamlessly. While waiting, we listened to rhythmic chiming of what sounded like Indian hand cymbals, or manjira, followed by bird sounds. This soundscape created a tranquil bridge to nature, and was an effective foil for for the first act that followed. Invited members of the audience sat on the sides of the stage, holding the space safe and sacred as the dancers entered in dim, portentous lighting. As they moved in varying ways to various parts of the stage, one had the impression of women of humble, rustic backgrounds going about their daily lives, trying to face up to the enormous challenges of industrial overbearing -- and of the resistance to a loss of livelihood, habitat and control. A quick note on the movement vocabulary of Ananya Dance Theatre may be useful here. Known as Yorchha™, it is a tribute to three Indian movement disciplines it draws from: yoga, Odissi (a classical dance movement from the eastern Indian state of Odisha, formerly known as Orissa), and Chhau (a dance form with martial, tribal, and folk origins). Yorchha™ was created by Ananya in her quest to create a contemporary language that allows for a feminine aesthetic and energy to embody resistance and new possibility. One of the namesakes, Odissi, is characterized by an undulating grace and by Tribhanga (a three-part bend of the body in a gentle 'S' curve, with oppositional breaks at the neck, torso and knee). Another, Mayurbhanj Chhau, is a virile and vigorous dance form derived from a martial arts tradition, and has historically been male-dominated. By combining elements of these allied but disparate movement vocabularies, Ananya has created a unique, subversive language to explore themes that are far removed from the idealized mythological and spiritual worlds these styles usually occupy. As the dancing in this act intensified, we witnessed violence and assault in the form of chopping, slashing, cutting and hacking. The women screamed, vocalizing their pain, their grief, their resistance, even as they were cut down and fell one by one into a heap, motionless. A lone survivor lifted a prop -- which was first a lifeless baby, then a blanket, then a backpack -- heartrendingly mourning the loss of these other lives. She issued a desperate plea to the universe against the injustice, compelling us all to look, listen, feel and care. Guest artist Janzell Luika walked in as the Goddess of New Dawns, with otherworldly vocals, dressed in white flowing robes, and issuing a call for healing and rebirth: “...Come, let us sit in hope, breathe life, change, birth anew...” At this time, the audience members holding the stage space returned to their seats gently and with the flow of her voice, reluctant to disturb the cursive tide of renewal. Dancers crawled and rolled in. A toe poked out here, a hand raised itself there: all were emergent movements that reminded one of burgeoning shoots and sprouting cotyledons. In the background, barbed wire and different images of walls appeared, reminding one of the boundaries being enforced and perhaps closing in menacingly on the stories unfolding before us. The highlight of this act was a sensuous and undulating duet by Leila Awadallah and Renée Copeland. They intertwined like vine and creeper, forest tree and flower, and danced like nymphs immersed in play, in each other, and in their mutual love and support. I felt afraid to breathe lest I disturb the painting of ethereal joy that they presented. The aesthete in me relished the Odissi technique on full display in this segment. Another poignant segment was Ananya's own solo, in which her physical discipline and power was evident in the series of formidable yoga movements she utilized to summon up a commanding image of dissent, strife, and the energy it takes to sustain that struggle. The musical landscape, with fragmented melody interrupted by rough unsettling sounds, kept one at the edge of one's seat and with a knot in the pit of one's stomach -- never letting one ease into a state of passive consumption. Large, undulating movements revealed pulling in different directions, perhaps a metaphor for the emotional toll that activists undergo. The penultimate image was one of Ananya lying spent on the floor. Then Felicia swept in, a surging, billowing, gushing river, with a couple dancers holding a long rippling train; these women washed away the fear, pain, grief, and sheer fatigue, making way for hope and new beginnings again. The screen displayed a wall, or perhaps a fence, with cracks in it; we saw small, mossy fragments hinting at the resilience of life, and of hope. One by one, the dancers entered with mirror shields which, the program notes indicated, were inspired by the Oceti Sakowin water protectors at Standing Rock. Mirror shields, but no swords, spears, or instruments of offense: only the clear reflection of the oppressor staring right back at himself in the shield. What a powerful statement with which to embrace the higher principle of love and support, and to refrain from violence while being violated! Speaking with Dr. Ananya Chatterjea, I learned of the profound impact that the water protectors and their unwavering adherence to the principle that inspired this segment had at the Standing Rock protests. The Odissi stance of Chowka, wide-legged and low-hipped, was clearly seen here, as strong footwork created percussion. The dancers recited rhythmic syllables -- Taa Kada Taka Jham -- where the music offered no such support. The dancers ended with the insistent drumming of their feet in resonant rhythm while offering up a poem penned by Ananya. The poem served as a call to let go of the hate unleashed in protest, and to hew to a greater love and a common humanity. we kiss the earth, hold each other sacred. ........No, no, no, no, no. And finally, silently coming together, the dancers swayed together like lush grass in a breeze. Like the image on the screen behind them, with typical Odissi grace and ebullience, they bent but never broke, united and inspiring in their resolve and credence. I left the hall with a recalcitrant catch in my throat, unable to attribute it to any one moment in the evening, but compelled by the sheer ferocity of will to prevail and the galvanizing power of conviction that seemed to descend from each of the women on stage that evening.